Dehradun : Uttarakhand Chief Minister Harish Rawat’s social agenda today received a major forward thrust with the signing of a Memorandum of Understanding (MOU) with The Hans Foundation (THF) to launch a slew of development projects and initiatives across multiple segments including Healthcare & Disability, Agriculture, Education, Forest Regeneration, Water & Sanitation and Electrification of Villages. 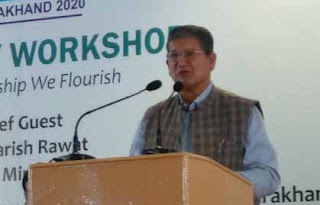 Being spearheaded by THF in conjunction with the Uttarakhand State Government the program is being developed and personally monitored, from the government’s end, by Harish Rawat himself through a special team handpicked by him for the task. Commenting on the initiative and its significance to the state, Harish Rawat said: “I have always maintained that for a young hill state like ours, growth and sustainable development cannot be attained if inclusive social development is not a central element of its growth effort." He added, "At the same time with the increased challenge of raising finances without the ability to develop and exploit mainstream industries like in the flatter regions of the country ensuring overall social development can only happen through active participation of civil society and tons of ingenuity." “This wide ranging MOU with The Hans Foundation and its consortium of specialist partner NGO’s is exactly the kind of fill-up my government was seeking and am confident this initiative will go a long way in allowing an all around social development of the state. I thank The Hans Foundation and all its associate partners for this commitment of theirs and assure them my personal support and involvement in ensuring that this effort of theirs comes out as a huge success,” added Harish Rawat.